There are first starts of the season for Quinn Roux and Jake Heenan, while Rory Scholes and Denis Coulson are set for debuts. Rory Scholes will make his competitive debut for the province. CONNACHT HEAD COACH Kieran Keane has rung the changes for his side’s Guinness Pro14 clash with Dragons at Rodney Parade tomorrow evening, making sevens alterations in personnel from the win over the Southern Kings last week. Caolin Blade, Conor Carey, Ireland international Quinn Roux and Jake Heenan are all set to make their first starts of the season, while new arrivals Rory Scholes and Denis Coulson will make their first competitive starts for the club. Eoghan Masterson comes back in for his second start of the season to complete the changes from last Saturday’s bonus point victory over the South African side in Galway. Scholes, who joined from Edinburgh and featured during pre-season, scoring a try against Bristol, replaces Matt Healy on the wing while Blade starts at scrum-half in place of Kieran Marmion, who is named among the replacements. The other five changes come in the pack. Coulson is joined in the front row by Tom McCartney and Carey following his move from Grenoble whole Roux comes into the second row and Heenan the back row. Sean O’Brien drops out through injury. 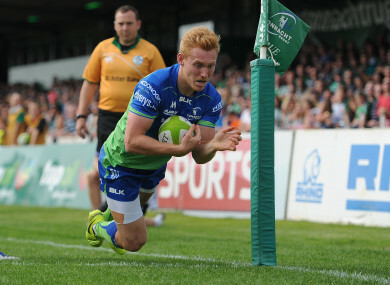 Connacht have six points from their opening two Pro14 games and are on the road for the first time this week as they travel to face Bernard Jackman’s Dragons, who are still searching for their first win of the campaign. The hosts will be boosted by the return of Welsh international Ollie Griffiths as well as South African scrum-half Sarel Pretorious for the meeting with the western province [KO 7.35pm]. In total, Jackman has made three changes from the side that lost to Edinburgh last time out with Gavin Henson and former Leinster back Zane Kirchner continuing at out-half and fullback respectively. Email “Connacht coach Keane makes seven changes for Pro14 trip to Dragons ”. Feedback on “Connacht coach Keane makes seven changes for Pro14 trip to Dragons ”.